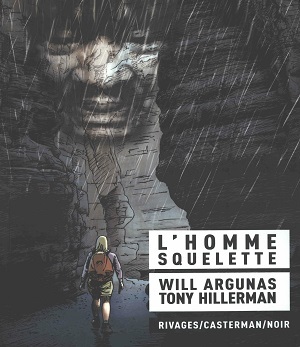 This edition of Skeleton Man is the first graphic novel of Hillerman's work and was illustrated by Will Argunas. This 2011 edition was published by Riaves/Casterman/Noir in Paris, France. Hillerman's text was translated from English into French by Danièle and Pierre Bondil. Format: Paperback, 26 x 18.5 cm. Binding: Full-colored paper covers with the title, authors, and publisher's logo on the spine.